Apple today published its picks for the best media in 2018 across its various platforms and services. These include selections for best app on iPhone, iPad, Mac, and Apple TV, as well as top picks in categories of music, TV and movies, podcasts, and books. Alongside these editorial selections, Apple has published top charts for the year across the App Store, Apple Music, Apple Podcasts, and Apple Books. Apple's pick for the iPhone's App of the Year is Procreate Pocket, the phone-sized version of the iPad's Procreate sketching app. The selection should come as no surprise because according to Apple's top apps charts, Procreate for iPad was the best selling iOS app of the year. The winner of iPhone Game of the Year is Donut County, a story-driven physics and puzzle game where you play as an ever-growing hole in the ground, sucking in objects to solve each puzzle. The game features a fun combination of innovative play mechanics, beautiful visuals, and a zany world to play in. If you're interested in learning more, our John Voorhees reviewed the Mac version of the game earlier this year. Perhaps unsurprisingly, the iPad selection for App of the Year is an AR-powered education app, Froggipedia; iPad Game of the Year honors went to Gorogoa, a puzzle game where you re-arrange beautifully illustrated panels to combine them in just the right way. On the Mac, Pixelmator Pro was named App of the Year, and the Game of the Year is The Gardens Between. The Apple TV's App and Game of the Year, respectively, are Sweat and Alto's Odyssey. Finally, signaling perhaps its status as the most destitute of app platforms, the Apple Watch didn't receive its own App and Game of the Year, but instead Apple's editorial team assembled a single list of their favorite Watch apps, which includes a mix of self-care and activity apps alongside excellent utilities like CARROT Weather, Overcast, and Just Press Record. Rounding out the category of apps, Apple highlighted two major trends on the App Store in 2018. The App Trend of the Year was Self-Care, with Apple featuring apps focused on motivation, meditation, and self-coaching. The Game Trend of the Year was Battle Royale, driven by the popularity of Fortnite and PUBG. 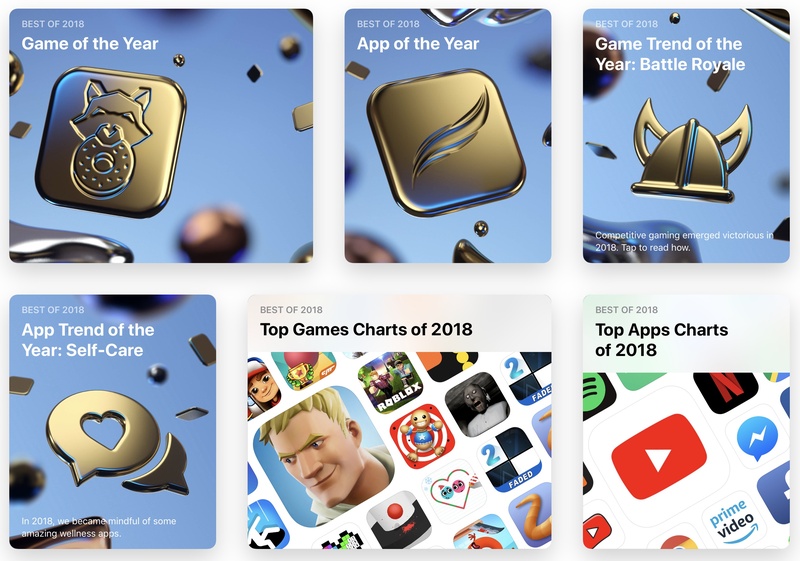 The App Store is but one of many media sources on Apple platforms, so the company has also made editorial selections for things like best music, podcasts, books, TV, and movies of the year. Drake was named Apple Music's Artist of the Year, while Song of the Year and Album of the Year honors went to I Like It by Cardi B and Golden Hour by Kacey Musgraves, respectively. Book of the Year was awarded to Tayari Jones' An American Marriage. 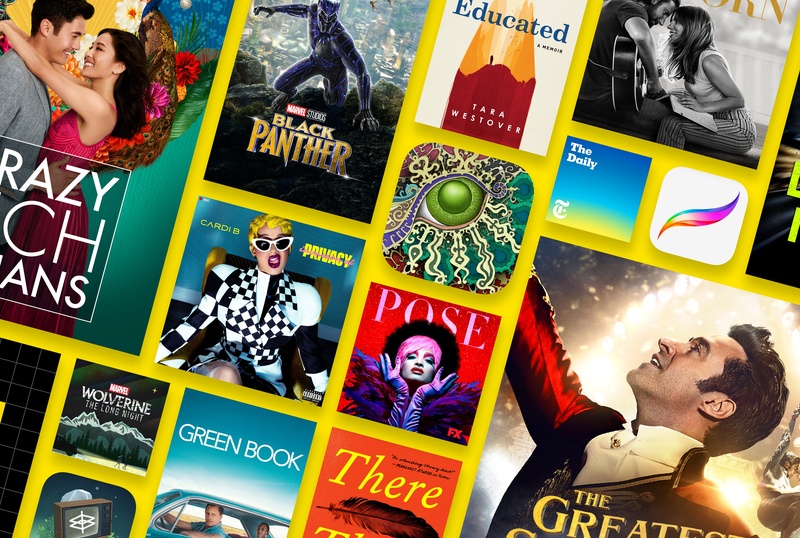 Rather than singling out individual winners, in the categories of podcasts, TV shows, and movies Apple simply highlighted a variety of its favorites. The full lists for all 2018 picks are available in Apple's press release, or they can be found by visiting the iOS Music, Podcasts, Books, TV, or iTunes Store apps. 2018 Top Apps Charts, which are specific to iPhone or iPad depending on which device you use to view them. 2018 Top Games Charts, which are similarly device-specific. 2018 Apple Music Charts, featuring the top 100 songs and albums. 2018 Apple Podcasts Charts, featuring the 25 most downloaded shows and top 25 new shows. 2018 Apple Books Charts, featuring the top 100 fiction and non-fiction titles.